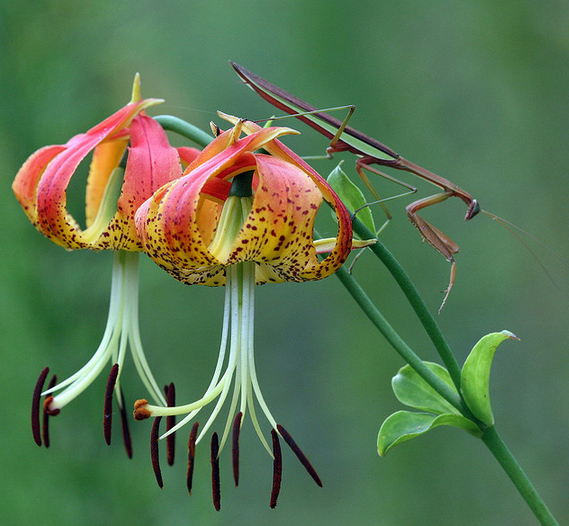 Carolina lily (and friend); photo © Jim Stewart on Flickr (all rights reserved; used by permission). North Carolina designated the Carolina lily (Lilium michauxii) as the official State wildflower in 2003. This spectacular wildflower grows throughout North Carolina, from the forests and hills of Cherokee County to the coastal swamplands of Hyde and Pamlico Counties. The stem of the Carolina lily can grow up to 4 feet high and can have up to 6 flowers at the summit (1-3 is more common). The flower petals are brilliant red-orange with brown spots and curl back to overlap. The Carolina lily grows throughout the southeast, from West Virginia to Florida, blooming as late as October (though most blooms are seen between July and August).